When you don't get enough of the nutrients you need for good health, you run the risk of becoming malnourished. These nutrients include proteins, carbohydrates, fats, vitamins and minerals. Symptoms of malnutrition can include dizziness, fatigue and weight loss, although you may have no symptoms at all, according to the National Institutes of Health. While the news is full of stories of malnutrition elsewhere in the world, many people don't realize that malnutrition is a problem in the United States, as well. More than 30 million Americans experience hunger regularly or are at risk of going hungry, according to the Child Welfare League of America. Some 8.5 million Americans, including nearly 3 million children, experience hunger on a daily basis Many of them must rely on food banks and church-sponsored hot meals programs to get by. Of course, those who don't get enough to eat run the risk of becoming malnourished. Some 13 million American children live in homes with limited access to food, and an average one in three children receive food assistance via the food stamp program called the Supplemental Nutrition Assistance Program, according to the Louisiana State University Agricultural Center. Malnutrition leaves children vulnerable to illness and infection. It can also lead to higher levels of aggression, hyperactivity and anxiety. Malnutrition also affects a developing child’s ability to learn. 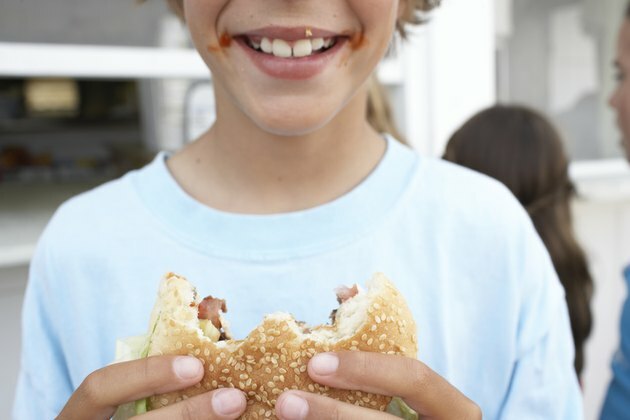 Children in food-insufficient homes don't do as well in school as those whose nutrition is adequate, according to Louisiana State University. Long-term malnutrition in children can lead to stunted growth and mental and physical disabilities. Just as many children face issues of malnutrition, so do the elderly. Living on fixed incomes and facing rising medical costs, many are forced to decide between food and medications. According to the Centers for Disease Control and Prevention, 2,000 to 3,000 elderly adults die each year as a result of malnutrition. Vitamin deficiencies are a form of malnutrition, and one vitamin deficiency in particular has become a health concern in the United States. More than 75 percent of Americans are deficient in vitamin D, according to a 2009 study published in the “Archives of Internal Medicine.” Vitamin D is a fat-soluble vitamin that can be acquired by consuming fortified milk and oily fish such as salmon. Vitamin D deficiency is associated with an increased risk of bone conditions such as osteomalacia, as well as autoimmune diseases, certain cancers and obesity. Eating disorders, some medical conditions and obesity can also lead to malnourishment. celiac disease, chronic liver disease, Crohn's disease and some cancers can affect your body's ability to absorb sugars, fats, proteins and vitamins. Certain medications can also limit your body's ability to absorb nutrients, as can surgical procedures designed to treat obesity. Further, those who anorexic, bulimic or obese run the risk of malnutrition, because they don't get enough of the right nutrition, or that nutrition never reaches the stomach.